October, 2003--What could My Boy have been thinking at age two? Daddy is this how you put your goatee on every day!? Daddy, why do Pirates need makeup? Ha! Love it! What a fabulous pirate. Aw, he made an adorable pirate! Ha ha! That's great! My girl was a pirate a few years back, she got a make-up goatee, too!! What an adorable little pirate!! What a cute little pirate you have there. The G-man was almost going to be a pirate this year. Maybe next year! So cute! 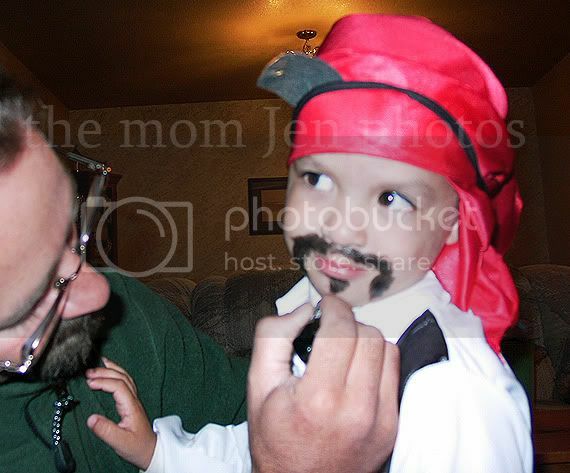 B was a pirate when he was 6, makeup and all! Have your kids decided what they are going to be this year yet? so cute, but my fav... is his sweet little hand on dad's chest- makes me melt! AH!! You're so right Tena, I didn't even notice that...aw. Cutest little pirate ever! Watch out Johnny Depp! 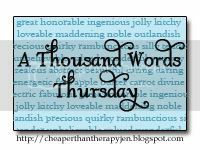 I love the words, even though I can't see the pic! Adorable--I love that, "Why do pirates need to wear makeup?" How Cute is that!! My kids can't wait for Halloween to get here...they are all a buzz with what they are going to be!! Yes.. I can see it now.. Daddy.. where is your eye liner? LOL! Such a adorable pirate, his big brown eyes and sweet little lips. I miss mine at this age all cute and innocent.